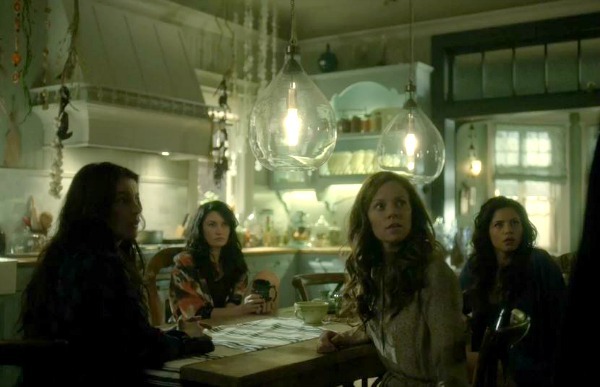 Inside the Red Victorian House on the TV Show "Witches of East End"
*UPDATE: This same house is now being used in the Charmed reboot on The CW! See how it looks on that show here. I was excited to find a video tour of the sets that aired on Entertainment Tonight. 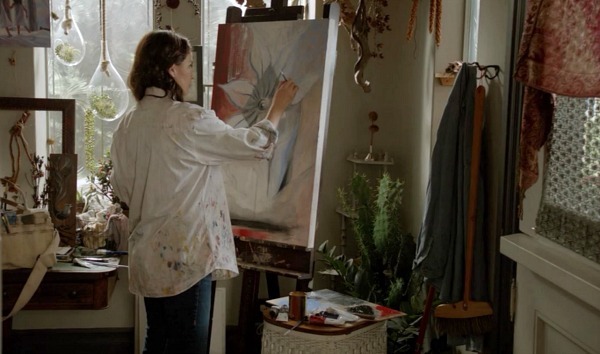 For those of you who haven’t seen the show, it’s about an artist named Joanna Beauchamp (Julia Ormond) who lives with her grown daughters Ingrid and Freya in a secluded seaside town on Long Island. She’s been keeping a secret from them, though — she’s a witch, and so are they. Wendy doesn’t appear in the book series the show was based on, written by Melissa de la Cruz. The glass pocket doors always have me reaching for the “pause” on my remote! 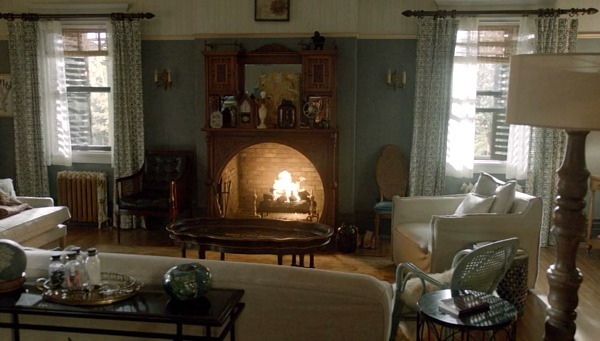 Lots of great fireplaces in this house. They have one in just about every room. The main living room looks a little lighter and modern than some of the other rooms in the house. Ingrid is a librarian and researcher who is determined to learn about her past lives (the girls always die around around this age and are reborn, over and over). Jason George played Ingrid’s ill-fated love interest Adam in the first season. 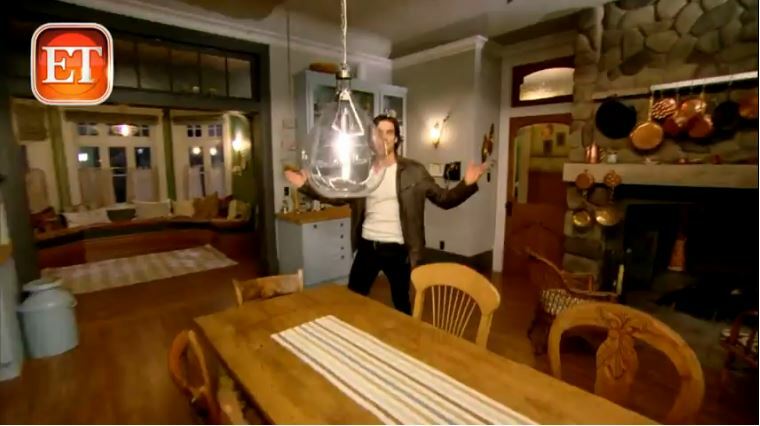 He’s now playing Alyssa Milano’s boyfriend on Mistresses (I featured her fabulous kitchen from that show here). The sets have changed since the pilot. 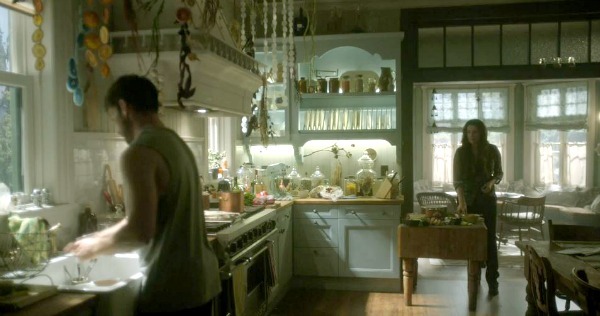 For example, this is how the kitchen looked in the first episode. It had cream cabinets and a generally warmer look to it than it does now. The pilot was filmed in Wilmington, North Carolina. After the series was picked up, they moved to Vancouver. 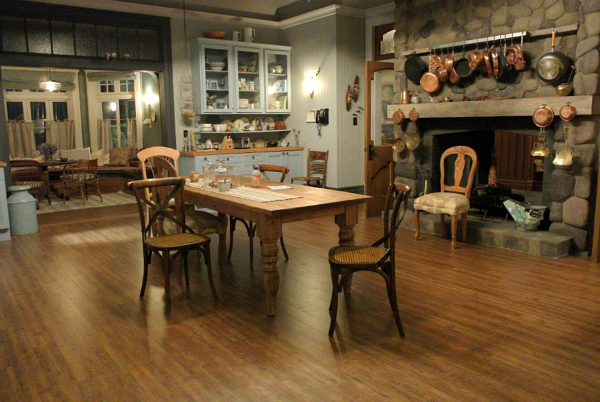 Starting with the second episode of the series, the kitchen was much more blue and gray. 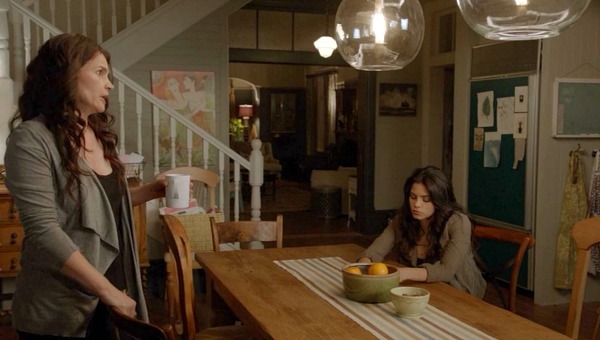 Free-spirited sister Freya is played by Jenna Dewan-Tatum, who’s married to Channing Tatum in real life. 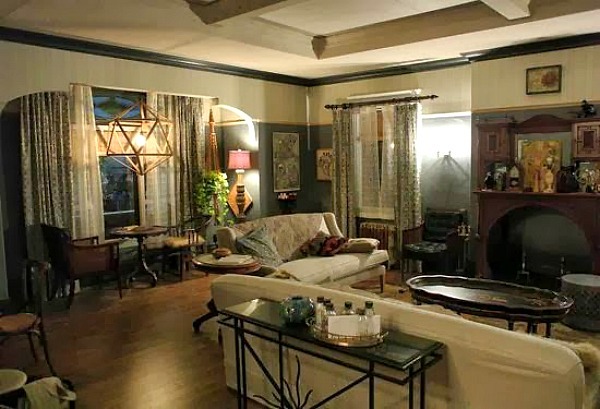 There are some other amazing sets on the show, like of the beautiful old two-story library that Ingrid works at and the Gardiner family mansion called Fairhaven. Wish I had time to feature them all. 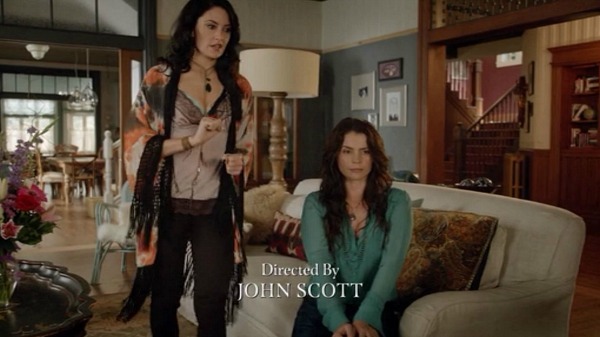 Starting with Season 2, they began shooting the sets more dramatically. The lighting is darker and moodier. 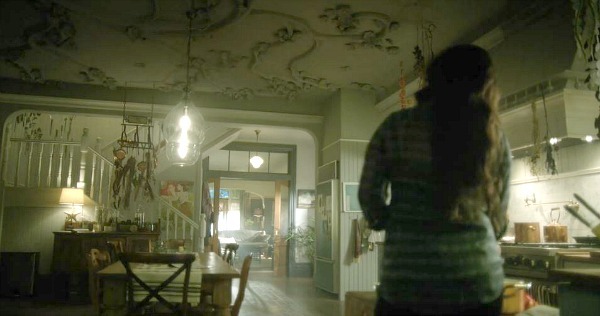 And they added beautiful ceiling details that they pan up to show us in a lot of the scenes now. 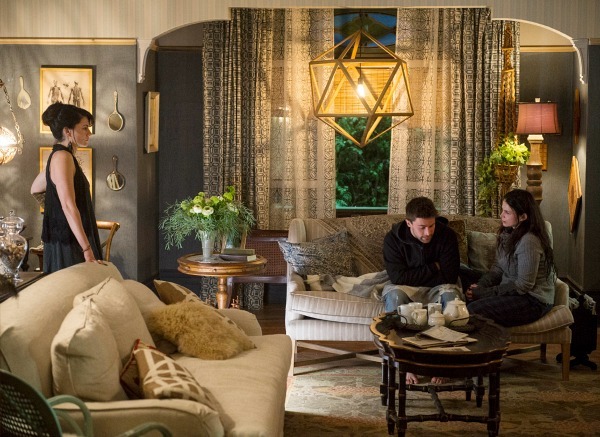 The tagline for Season 2 is “Darkness Rising,” and the sets seem to reflect the darker tone. It’s amazing the difference that lighting can make, isn’t it? 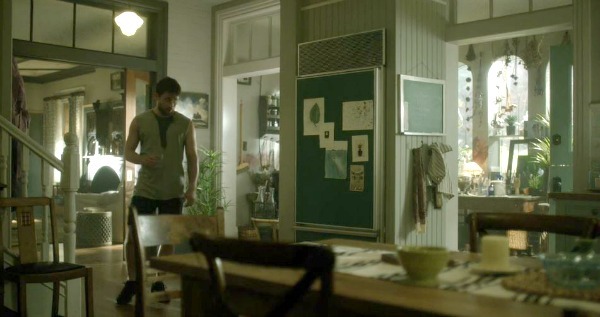 Pilots are often shot in real houses and then sets are built if the show’s picked up, which makes me wonder if at least some of the rooms in the first episode belong to a real house. I haven’t been able to find any information about the exterior or interiors they used, though, so if anyone has any insider info, fill us in! Have you read any of the books? They’re on my reading list! For more information about the show, visit Lifetime. Harrison Ford's Country House in "Patriot Games"
Did You Recognize the House in the New “Charmed” Reboot? I too have noticed how the house has changed this year. I loved the house last year too. 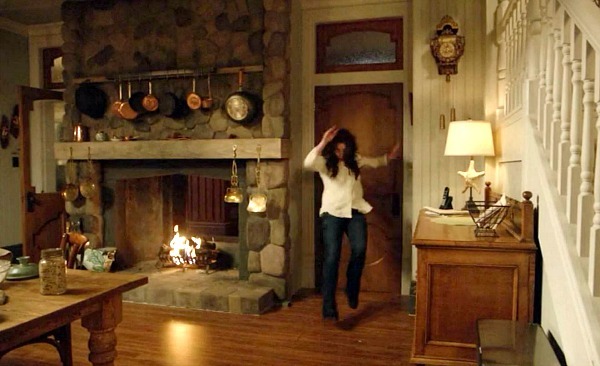 The kitchen was perfect but it was perfected this season. With all the changes to the set . 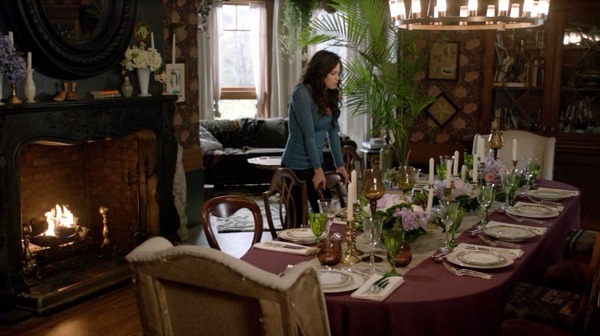 I really loved seeing all the windows over the doors like in the Victorian houses. I just hope the house doesn’t get destroyed this season. 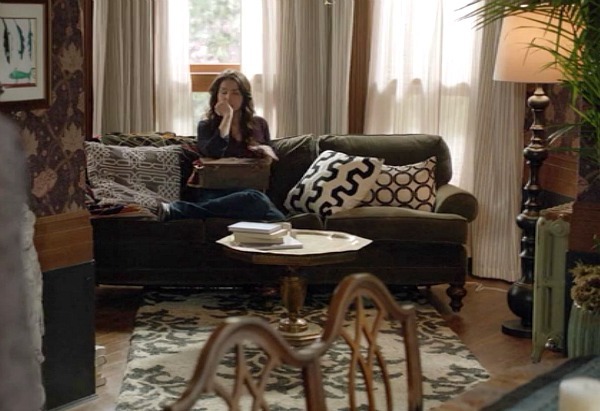 I also love that show and hope it stays on for a few years because i like looking at the library too! Hi Charlotte! It’s definitely gotten darker this season. It was a little more light-hearted and fun last year, I thought. You can really see how the mood changed just by looking at the set changes! Madchen looked so different in “Twin Peaks,” didn’t she? Not only younger, but without that jet-black hair. I barely recognized her on this at first. I love Aunt Wendy — she brings some humor to the show and makes me laugh. 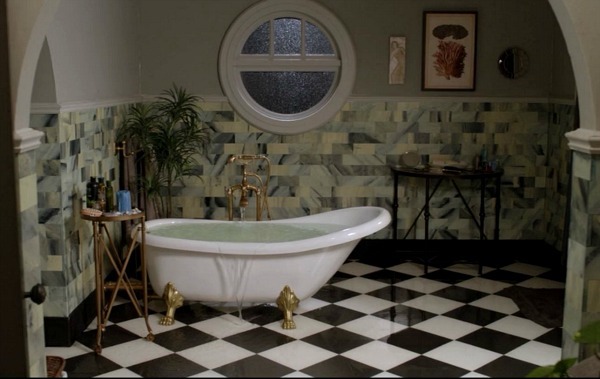 I should have mentioned that it was your recent feature of Laura Palmer’s Dutch Colonial from “Twin Peaks” which inspired me to watch Twin Peaks. I liked the show and ended up eating a lot of pie with damn fine coffee in the process! Thanks!!! There isn’t too much info out there, but I found a few places, sadly not the house we care about. Wilmington is my 2nd home, so it’s always fun to see it pop up on tv and know where they are! 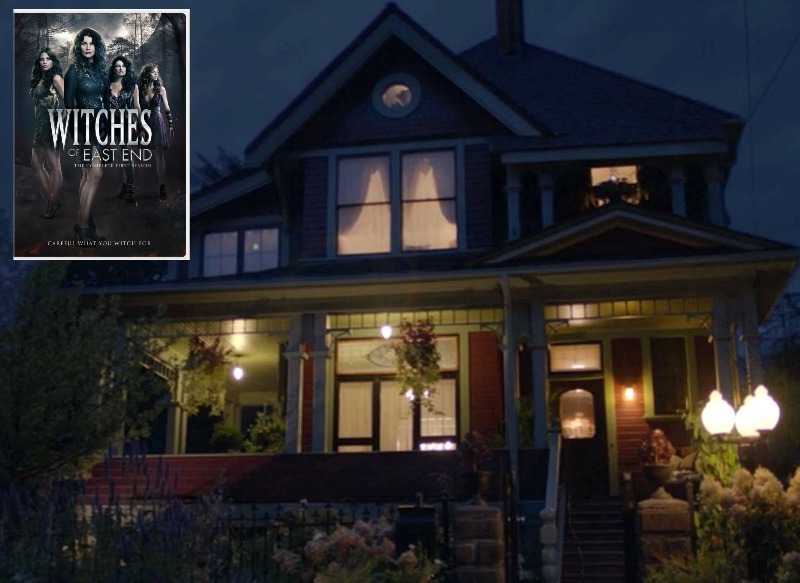 https://www.onlocationvacations.com/2012/10/11/witches-of-east-end-upcoming-filming-locations-in-wilmington-n-c/ – On this list, 4th Street is the only one that’s a house, but not theirs. 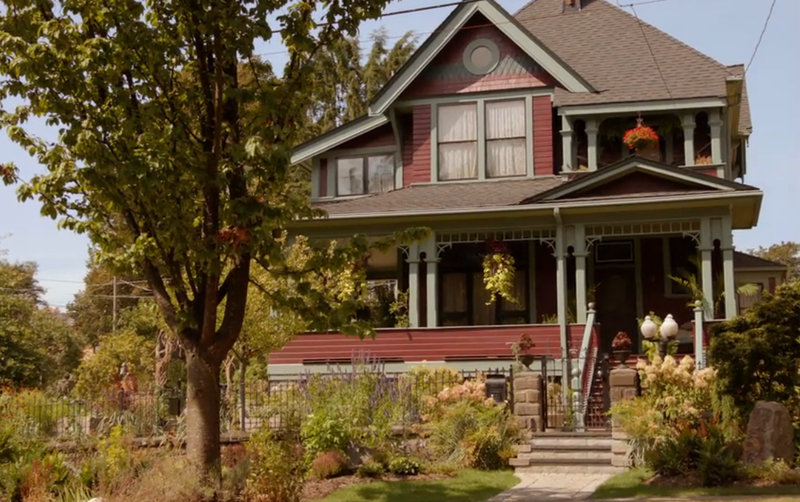 I remember them visiting a neighbor or something in the pilot, and I believe it’s this house. Thanks, Sara! I’m surprised there isn’t more information out there about this house. I’ve gotten a lot of emails from readers wanting to know more about it, so I know the interest is there. 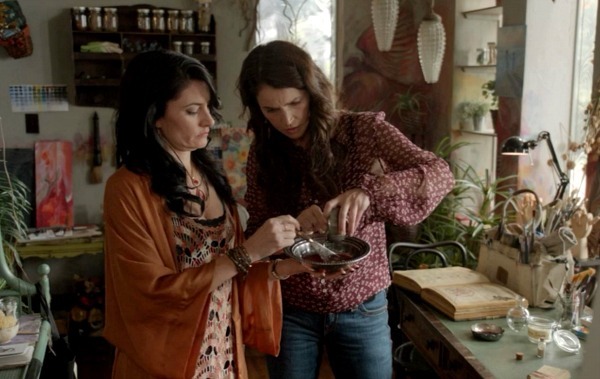 I keep hoping they’ll post more about the sets on Lifetime’s “Witches” page! I have not watched but what a wonderful house. Maybe a little to dark but can see how that would fit the atmosphere of a show about witches. I like the kitchen. I like the look of glass front cabinets. 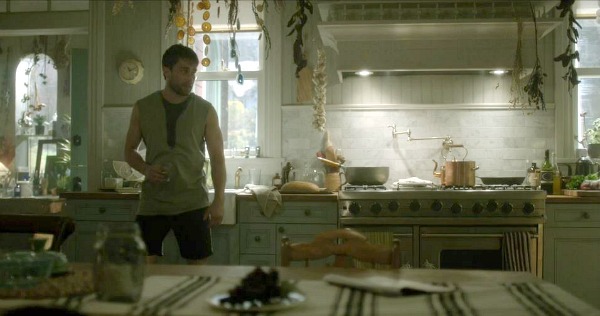 Also, my dream kitchen, came from different books I’m sure, always seems to have a fire place or wood burning stove and a long beat up farm table. I want to say any book that had a Manor or English or American farm house had these. That kitchen nook with a cup of tea or coffee and a book would be a dream. Why do witches always seem to get the best houses? This one is a beauty! 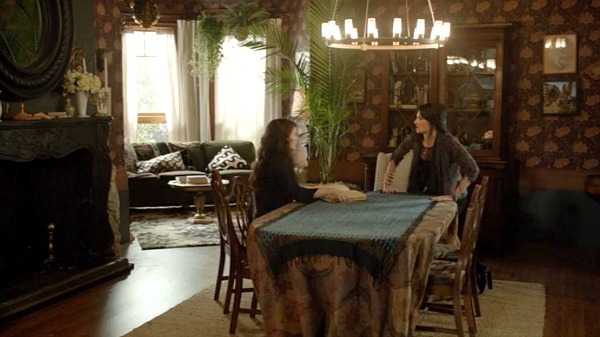 And yes, I would live in that breakfast nook, too! I know, it’s so true! From Nicole Kidman’s house in the “Bewitched” movie to “Charmed” and “Practical Magic,” etc., you name it, they all had great houses. I was hoping you were watching the show! 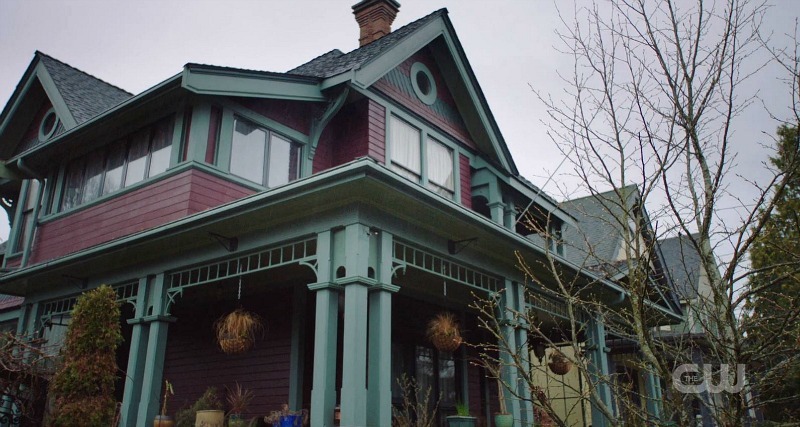 I just started watching this show last week on Netflix, and I actually searched your blog for this house over the weekend (which allowed me a chance to revisit my beloved Charmed house BTW). Anyway, the kitchen is beautiful. I would love a stone fireplace. Wow! I’ve never seen the show but now I want to! I like how warm it looks, I’m not a fan of the white on white fad. 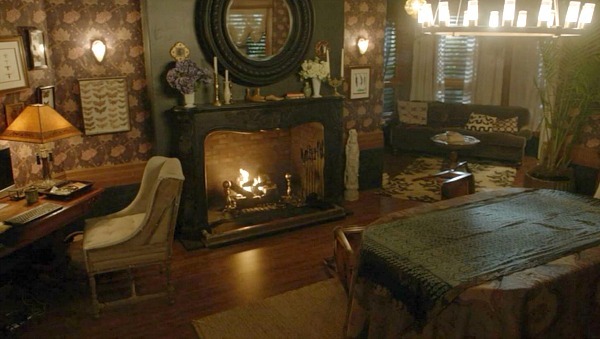 It looks so cozy, I want to curl up next to the fireplace and read a book! Now I’m going to go check the show out…. 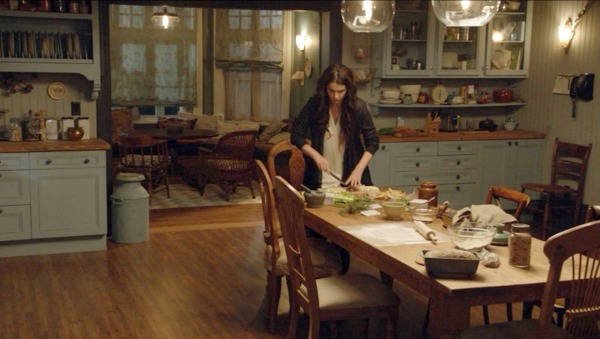 I’ve only seen the show in bits and pieces, but I too loooove the kitchen nook and the dining room pocket doors, they are so unique. 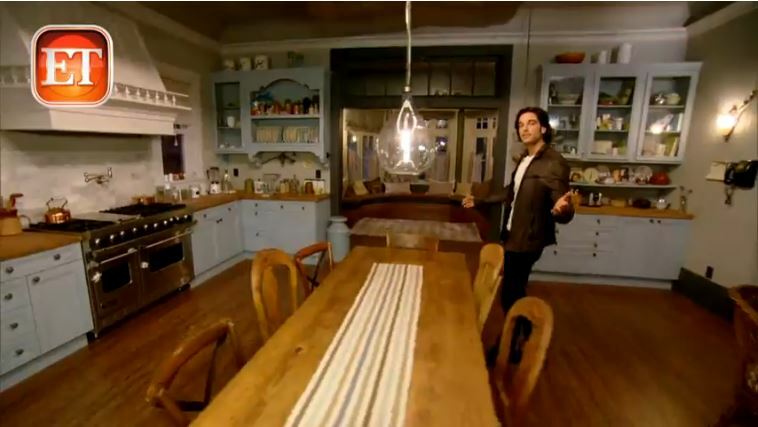 I always tell myself if I move into a house with a kitchen large enough, I will definitely build a kitchen nook like the one from this show!!! 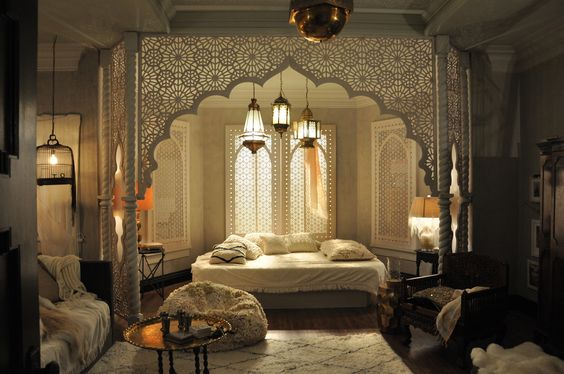 Realistically though, I would need those windows…. I have never seen this show. Looks interesting! 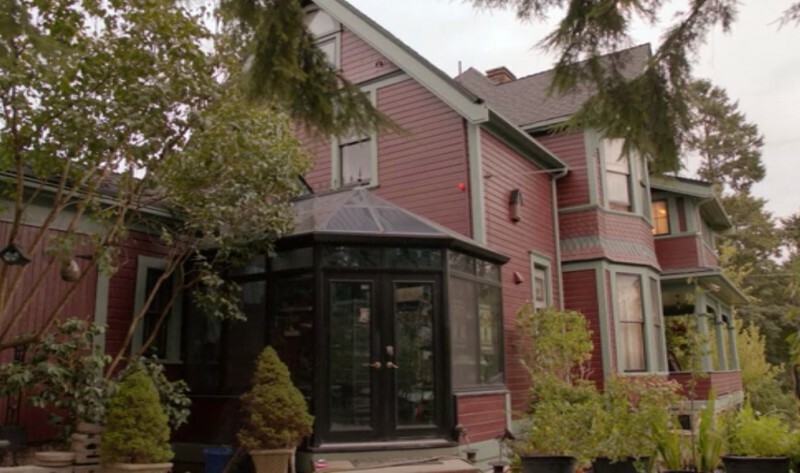 The outside does indeed look like the Charmed house. I prefer the second kitchen, as it’s larger and I love blue. The blue living room is fabulous as well! The patterned french doors seem a bit too modern for this home. So glad you finally did this house. I’ve been asking for it since the first show. 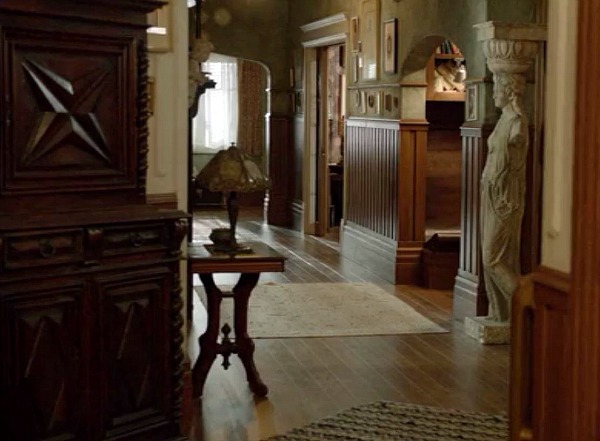 To bad the original house is still a mystery. We’ll keep looking. I discovered this show by accident then watched the entirety of season 1 in one day! Now I’m totally hooked. 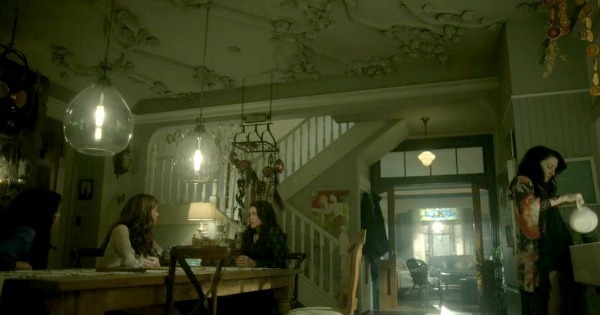 The house (or at least the sets) are amazingly gorgeous! 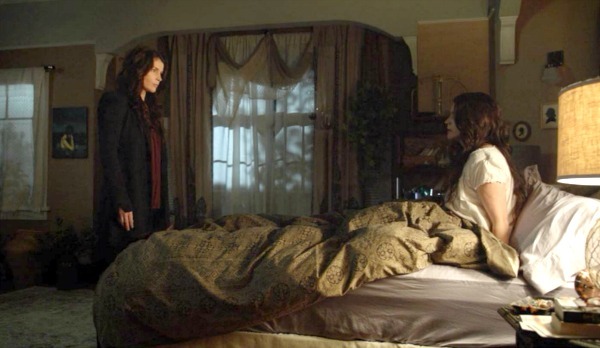 And the tone of the show certainly did become darker in season 2. But I love it! uncanny. 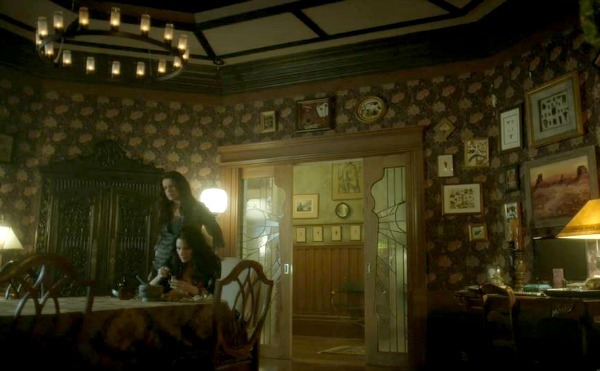 after your charmed post i set up a pinboard for fictional witch houses. then the other night i was pinning set photos from the show’s website. they made them available in good sizes so you can really see the details. i’ve only watched the show occasionally – sunday is a very full night. it’s okay. i’m a bit confused about the twin brother. aunt wendy’s wardrobe is certainly great. I too, absolutely love this show. My favorite room is the kitchen. The stories are great, but I truly believe it’s the house that makes it work. 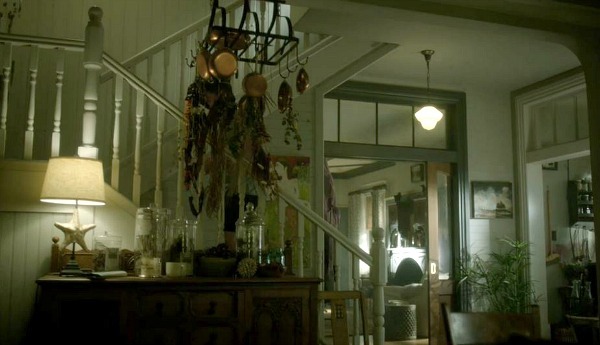 I’m wondering if the staircase in the kitchen is the back one; and that there is another one in the foyer. A girl can dream, right? !